No Lights Not Lycra is exactly like Zoomba — if Zoomba was in the dark and consisted entirely of flailing. Photo courtesy of Ceda Verbakel. If you make your way into the basement of the Dovercourt House on a Monday night, you’ll find yourself in a candlelit room, filled with calming music and an assortment of 20 or so 20-somethings. You’d be forgiven for thinking you stumbled upon a late-night yoga class, but you’d be mistaken; at 7:20 p.m. sharp, the lights begin to turn off one by one, and everyone starts to dance. No Lights No Lycra (NLNL) is billed as “a weekly dance jam in the dark for the joy of dancing.” The movement started in 2009, when two Australian students decided they were sick of the confines of regular dance classes, with their tight clothing and competitive atmosphere. Instead, they recreated the dance parties they’d been having in their own homes. Since then, NLNL has set up in 50 cities, including, two years ago, Toronto. As I sit down and take stock of the room, people start to trickle in, either alone or in twos and threes. I try and spot fellow virgins—a trio of guys in jeans and t-shirts seem likely candidates, while a woman in Richard Simmons-esque workout attire clearly means business. Suddenly, and without warning, the lights start to turn off. People rise to their feet and the first unmistakable bars of Wham!’s “Wake Me Up Before You Go-Go” fills the room. First things first: you can still totally see everyone. They’re spread out across the dance floor, moving about to the Wham! grooves, and they are extremely visible. You can’t see facial expressions, so instead it’s a mass of thrashing faceless entities. Definitely not the in-the-dark anonymity I’d been expecting. Aware that I’ve been standing awkwardly in my corner, I attempt a few lacklustre dance moves, but my heart’s not in it. I hate Wham!. I hate them so, so much, a fact unlikely to change in a darkly lit room full of strangers. I make my way over to a bench to wait for a song I actually like. As I wait, I take stock of the situation. As a well-documented awkward dancer, I have a deep appreciation for the form, and what I’m witnessing is a real tribute to the craft. People shimmy about, some on beat, some not; they don’t worry about the beat, or what the person next to them is doing. It’s bizarre, but also in some ways undeniably cool. Missy Elliott comes on and I make way back for a second attempt. This time I try closing my eyes for a proper dancing-in-the dark experience, and start to actually get into it. This is fun and awesome, I think to myself. This is all of the joys of dancing alone in your bedroom, except you are with your fellow man, coming together in awkward harmony. Then I open my eyes to find that I inadvertently inserted myself between two men who are wildly flapping about. I try to escape but its a flailing Bermuda Triangle—every time I make a move they do the opposite, blocking my exit. I finally resort to a crouching retreat, resolving to keep my eyes firmly open from now on. As the hour progresses, the room gets noticeably more relaxed and happy; people cheer and laugh and clap. I didn’t think I would be the sort of person to get really into an Ed Sheeran club remix, but it turns out that I am, and that doing so is the most fun I’ve had in weeks. 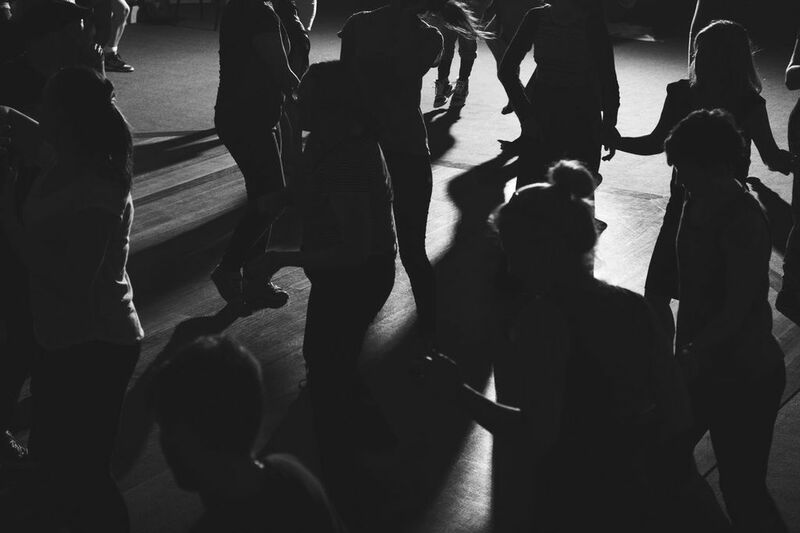 There is so much available to you on an anonymous dance floor. Sure, you don’t want to be the person twirling around at the club, but, newsflash, twirling is awesome and the ability to do it to any song you want is a serious luxury. I come to the realization that I have spent the majority of my adult life dancing in heels, and that this is horrible. If clubs were a barefoot, sweatpants affair, I would go clubbing every day of my young life. I end up chatting with Ceda Verbakel, who co-founded the Toronto chapter two years ago with her friend Laura McCarthy. She now runs it with what she describes as a “fleet” of others—Elisabeth Lang, Ramona McNabb, Lee Dares, Eric Allin, Ken Ferguson, Michelle Dyck, and Michelle MacAlesse. She says in Melbourne, where she’s from, there are six separate NLNL nights a week, each of which can draw up to 200 people. In contrast, Toronto is just getting started. Still, Ceda says the Toronto community is steadily growing—enough that they’re keeping their eyes out for a larger space to avoid lines at the door or a crowded dance floor. We chat about musical selection—”you need at least five certified bangers, but after that I like to mix it up”—and possible dance moves—”spinning is seriously the best,” she laughs. As I thank her and make my way toward the door, she says she hopes I’ll come again next week. I think I will. No Lights No Lycra hosts its second-anniversary dance party Feb. 26 at 918 Bathurst. CORRECTION: 3:50 PM A previous version of this story incorrectly stated that the Toronto chapter of NLNL was co-founded by Elisabeth Lang, not Laura McCarthy. Torontoist regrets the error.